I have just learned today that Milwaukee's premier wedding design firm will be closing, effective immediately. The White Box of Milwaukee will no longer be taking on clients as CEO Monica Rae Gill will be pursuing other interests. This is a very sad thing for Milwaukee and the wedding industry. Her excellent service will be missed. Oh. My. Blog. How wonderful are these?! These two lovelies are just the tip of the style iceberg over at Paper Olive Stationery. Based in Los Angeles, Paper Olive specializes in custom invitation couture. After having a bit of trouble finding a suitable custom design for her upcoming nuptials, Marleine Pacilio took matters into her own hands. Since it's launch in 2007, this little design dynamo has been featured in several premier wedding magazines and blogs (check out the press here). 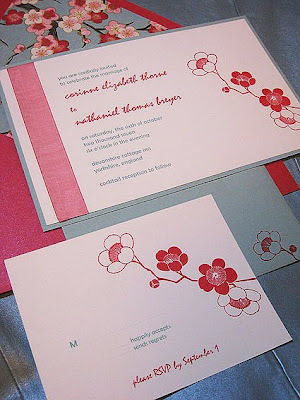 Paper Olive Stationery is no one-trick pony, let me assure you. 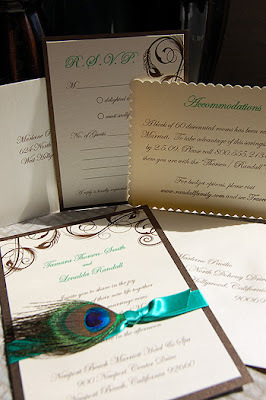 You can look to them for help with your at home cards, personal stationery, holiday cards, and party invitations. How do you get started?! Visit the website, browse the gallery, set up a consultation...and viola! You're all set! Ooh and there's a blog, too. The best part?! They offer a variety of print styles! There's an option for everyone! This page will give you all the details. Love. This. It's so important in the early stages of event planning to see what you're getting into up front. This way, no hearts sink when the "perfect" invitation can't be had because it's a Budget Buster. Ooh. Follow the blog too. I am. You won't regret it. 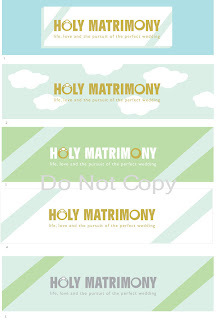 A New Look for Holy Matrimony! My brilliant designer friend has generously put together some banners for me. I love them all so much, I'm having trouble deciding. I thought show them to you and see what you think...I'm sooo excited! A BIG thank you to Miss Allison C. Beilke. Check out her etsy shop here and her website here. She has some really great stuff, I encourage you all to check it out! Also, stay tuned so you can give the new banner (when I finally choose one) a look-see! Allison is also working on some ideas for the Soiree as well! I'm excited to see what she comes up with. We're thinking something a little more sassy...soon I'll be able to show them to you! All designs are copyrighted. Please don't be a jerk. They belong to Allison, so don't steal them!. I am LOVING this right now! 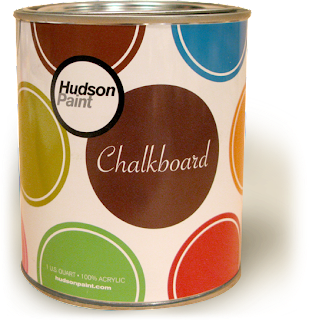 I stumbled upon a recipe for chalkboard paint. I know there are plenty of paint brands manufacturing this stuff right now and it's available online (like, here, here and here to name a few) but I like to do things myself. How else am I going to get exactly what I want? 1. Combine 1 cup paint with 2 TBSP grout in a separate container. Use the paint stirrer to break up the clumps and distribute grout evenly. 2. Using the tape, outline area to be painted. Working in small sections apply paint with roller. Cover area with more than one coat to ensure even coverage. Let dry. 3. Smooth over the area with sandpaper and remove dust. 4. Rub the side of a piece of chalk over the entire surface. Remove residue with a slightly damp sponge. I've been raring to make a grocery list/message center in my kitchen. I think it would be super cute! Functional too, but mostly really adorable! I'm thinking lemon yellow! Hopefully, I'll have pictures soon! For a more wedding-y approach, try making small chalkboards in your colors to serve as table numbers, place cards, favors or a large menu board. It would also be super cute to have a couple of larger chalkboards instead of guest books. Frame and cover with glass and storing should be a breeze! Also, think of the photo ops! Hey everyone! I just wanted to share with you one of my FAVORITE sites on party planning. I find a lot of inspiration there and I think you will too. The brains behind this fab Seattle event and rental company is Miss Sheena S. Kalso. Entrenched in the party biz for the last 5 years, this West Coast powerhouse was growing weary of the generic limitations of party rentals. She decided to rectify the problem and offer Seattleites flirty, fun and fabulous dinnerware options. Growing as one of the premier event companies in Seattle, Totally Tabletops is a perfect 10 in my book. Totally Tabletops is dedicated to thoughtful service and providing inspired products, making beautiful style and design accessible to all who share in the passion of entertaining and the belief that when people gather, memories are made. What a beautiful statement. Ah, me! What a great place to go for all your party needs. If only we had something like this here in the Cream City. There you have it. Totally Tabletops is totally brill and is a great place to go for inspiration, ideas and suggestions! Check out the blog or the website and I guarantee you won't be disappointed...I never am. Enjoy!